Looking at the models we have, considering size (amount) of activated carbon / chemical gas filter as well as air moving capability, taking price consideration as well, the AirRhino 2000 VS Carbon would be the model to consider. The chemicals you mentioned below score high on the activated carbon efficiency table – should be easily adsorbed by the activated carbon media. 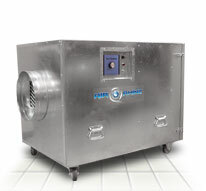 We also have other models, painted ones (better esthetically than the very industrial looking AirRhino 2000), http://www.airpurifiers-r-us.com/BP_heavy_odor.html, specifically the BP-2002 priced at $4046.00 USD, these are made by Quatro Air Technologies also here in Montreal. Will confirm CAD pricing. With this, I recommend four (4) units as well, same unit distribution as mentioned above. Are you experiencing delays getting your replacement filters for your Electrocorp AirRhino 2000 24 x 24 format air scrubber, air filtration system delivered?? Not funny at all, specially if you have a job, project, or work contract lined up and you’re kept waiting and waiting for a pre-filter, HEPA filter, or bulk activated carbon refill. We can help you fulfill your replacement filter supply, faster delivery, lower price, and most important of all, that you are able to deliver and fulfill your project or job contract obligations that you have worked hard to get.